An ambulance worker who suffered mental health problems at work has accused his employers of "destroying" his life and health, after a tribunal. Mechanic Gordon Flemming, from Norwich, won a case of unfair dismissal against the East of England Ambulance Service. The tribunal panel said it was "appalled" at some of the behaviour towards Mr Flemming, who recorded one boss talking about "pummelling" him. The ambulance service said it was considering the tribunal's judgement. 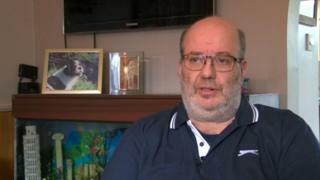 Speaking about the tribunal for the first time, Mr Flemming told the BBC the ambulance service was "there to save lives, not destroy them - but that is what they did to me". "They destroyed my life and destroyed my health," he said. "There needs to be a complete and utter culture change. The culture is cancerous." The tribunal heard Mr Flemming started working for the ambulance service as a motor vehicle technician in April 2009 but in April 2012 he suffered a heart attack. When Mr Flemming met his line manager in August, he felt the environment was "very hostile" and he suffered mental health problems. He had subsequent meetings with management but Mr Flemming was "never deemed well enough to return to work", said the tribunal. A number of meetings took place in 2013 and 2014 but nothing was resolved. In June 2015 Mr Flemming wrote to Debbie Bowman, the assistant to director of human resources at the service Ruth McAll, saying he was "suffering from a... crippling mental illness" and adding he was concerned they had attempted to "push me over the edge". The tribunal described as "appalling" Ms McAll's response, which threatened Mr Flemming with legal action if he wrote to anyone but Ms McAll herself. The panel, which published its judgement earlier this month, said the response "demonstrated no insight at all into the likely impact on a person contemplating suicide". Mr Flemming appeared at a disciplinary meeting in July 2015, chaired by deputy director for operations Robert Ashford. While Mr Flemming was out of the room, he had left a mobile phone recording, unbeknown to the management. It recorded a discussion about not wanting to agitate Mr Flemming, during which Mr Ashford was heard on the recording saying: "I mean getting up and pummelling it into him with my fists is probably not appropriate in terms of policy, is it?" A tribunal remedy hearing is due to take place in September. The ambulance service added: "We are unable to comment further as the matter is not yet concluded."